As I was pondering over what to create next in the metal studio, where I go every Thursday, I came across the idea of a bear, and a split second later, I knew the pose. 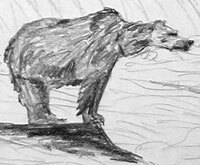 It would be the pose of a bear I drew many years ago in pencil. I ransacked my closet and found it. Tonight, I start.